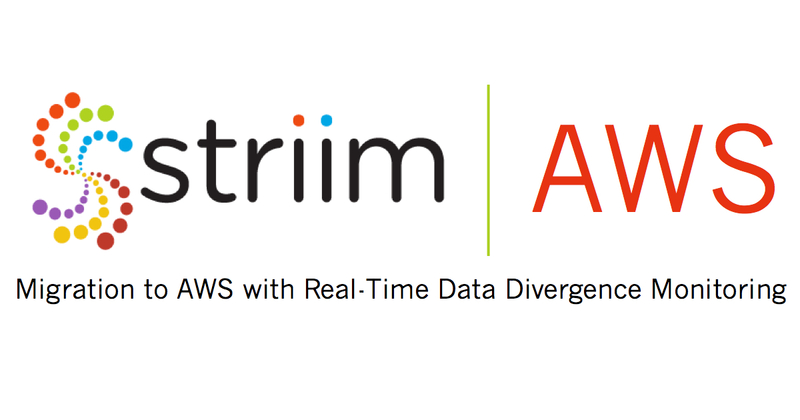 PALO ALTO, CA – November 27, 2018 – Striim®, provider of an enterprise-grade platform for streaming data integration, announced today it has extended its offering for Amazon Web Services (AWS) to include real-time data divergence monitoring, enabling risk-free data migration without business interruption or data loss. Striim’s engagement with AWS builds on an existing relationship. Striim moves real-time data from virtually any data source, including enterprise databases (via log-based change data capture or CDC), log files, messaging systems, sensors, and Hadoop data into AWS. AWS customers can rapidly build real-time data pipelines to Amazon Redshift, Amazon S3, Amazon RDS for Oracle, Amazon RDS for SQL Server, Amazon RDS for MySQL, Amazon Aurora, and Amazon Kinesis services. For AWS migrations, Striim provides real-time data synchronization capabilities, moving data from legacy databases to AWS RDS or Aurora databases without requiring downtime, and enabling an immediate switchover to the AWS environment. Striim can also validate data migration to AWS (including the AWS Data Migration solution) to avoid data loss or divergence. Striim non-intrusively collects changed data from legacy databases and the target AWS databases, and matches applied transactions in real time to verify the cloud database is synchronized. Users can see any data divergence in real time via live dashboards to ensure a successful migration. For more information about Striim’s platform-as-a-service offerings for AWS, watch the brief demo video, visit https://www.striim.com/partners/striim-for-aws/, or provision Striim in the AWS Marketplace. The Striim®platform is an enterprise-grade streaming data integration solution for moving data in real time to the cloud. Striim makes it easy to continuously ingest and process high volumes of streaming data from diverse sources (both on-premises or in the cloud), as well as Kafka, Hadoop, and NoSQL integration. Striim can collect data from enterprise databases (using non-intrusive change data capture), log files, messaging systems, and sensors in real time, and deliver to virtually any target on-premises or in the cloud with sub-second latency. For more information, visit www.striim.com, read our blog at www.striim.com/blog, follow @striimteam, or download the Striim platform.